It’s intended to highlight that marines of that era are all basically horrible people, trained to value self entitlement and military glory. Othering over empathy. Eating their fear, and shitting false bravado. And I guess it does the job of that. Like my nephew, everything that doesn’t go precisely their way is met with outrage and violence. My nephew’s excuse is that he’s two and a half. So I actually have two reviews here for you. First about Dogfight: The Musical, and then the show that Dogfight evolves into in the 2nd act — because they’re very different shows. 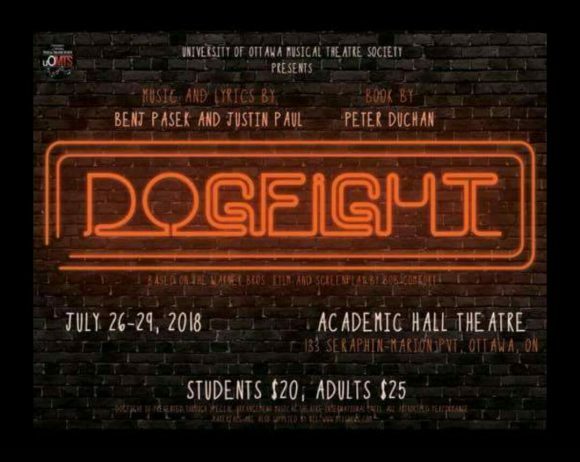 Here’s the trouble with Dogfight: The Musical — it’s a hard ask for an audience to connect to a bunch of happy-to-be-assholes as protagonists. The entire first act is devoted to the lead in to the Dogfight and to the Dogfight itself, i.e., the glorification of treating people like shoe scrapings, and leaving nobody with goals or aims worth taking an interest in or any characters worth giving a second thought. Add to that that the big musical numbers, featuring those same marines we’re supposed to love, were filled with choppy choreography, lacking of grace and uniformity, and so threw in all the flashy moves they could to overcompensate (kind of like the marines themselves). It wasn’t until the entrance of Rose that there was something in the first act worth seeing. Hilary Peck’s Rose was perfectly charming and had chemistry with everybody she shared a scene with. Other highlights included Abigail White’s obnoxiously loud-mouthed Marcy and Lena Kirkham’s awkwardly bizarre Ruth. Here’s the notable thing, somewhere early in the 2nd act, Dogfight: The Musical becomes a very different and entirely more interesting show. A show about the horrors of war, about what it takes to be a soldier, a young man, thrust into unthinkable violence, about the mindset needed to enter it, and about the mindset you’re left with on the way out. This new show gives us some creative choreography, interesting direction choices, and an overall higher quality of performance. I hadn’t mentioned Patrick Teed’s performance as Eddie Birdlace earlier, and that’s because I didn’t buy his first act arc of the conflicted marine. It lacked any nuance or contrast. This problem happily corrects itself here in the second act, with Teed giving us a compelling performance as a tortured soldier and clearly showing why he was chosen to lead this cast. The war sequence and moments following it through to the end packed a strong gut punch. It’s brave and courageous, well-told, and more than makes up for the shortcomings of the first act. As a complete side note/afterward — the director’s note highlights the themes of toxic masculinity and objectification of women, and the production does capture that, even if in problematic material, so it occurs to me how interesting it would be to see this production gender-swapped. If anybody ever takes that on, I’d love to hear about it. But that’s just my opinion and I’d love to know what you think. How engaged were you with the first act of Dogfight? Did you find yourself wondering what an odd situation for a casting director, casting an actress to play “the ugliest?” What was your favourite musical number or moment in the show?